Research method integrates meditation, science: the meditation experience does not have to be subjective. Mindfulness is always personal and often spiritual, but the meditation experience does not have to be subjective. Advances in methodology are allowing researchers to integrate mindfulness experiences with brain imaging and neural signal data to form testable hypotheses about the science — and the reported mental health benefits — of the practice. A team of Brown University researchers, led by junior Juan Santoyo, will present their research approach at 2:45 p.m on Saturday, April 5, 2014, at the 12th Annual International Scientific Conference of the Center for Mindfulness at the University of Massachusetts Medical School. Their methodology employs a structured coding of the reports meditators provide about their mental experiences. That can be rigorously correlated with quantitative neurophysiological measurements. Now researchers are gaining the tools to trace experiences described by meditators to specific activity in the brain. At the conference, the team will frame these broad implications with what might seem like a small distinction: whether meditators focus on their sensations of breathing in their nose or in their belly. The two meditation techniques hail from different East Asian traditions. Carefully coded experience data gathered by Santoyo, Kerr, and Harold Roth, professor of religious studies at Brown, show that the two techniques produced significantly different mental states in student meditators. The ability to distill a rigorous distinction between the experiences came not only from randomly assigning meditating students to two groups – one focused on the nose and one focused on the belly – but also by employing two independent coders to perform standardized analyses of the journal entries the students made immediately after meditating. This kind of structured coding of self-reported personal experience is called “grounded theory methodology.” Santoyo’s application of it to meditation allows for the formation of hypotheses. The next step is to correlate the coded experiences data with data from the brain itself. A team of researchers led by Kathleen Garrison at Yale University, including Santoyo and Kerr, did just that in a paper in Frontiers in Human Neuroscience in August 2013. The team worked with deeply experienced meditators to correlate the mental states they described during mindfulness with simultaneous activity in the posterior cingulate cortex (PCC). They measured that with real-time functional magnetic resonance imaging. They found that when meditators of several different traditions reported feelings of “effortless doing” and “undistracted awareness” during their meditation, their PCC showed little activity, but when they reported that they felt distracted and had to work at mindfulness, their PCC was significantly more active. Given the chance to observe real-time feedback on their PCC activity, some meditators were even able to control the levels of activity there. A theme of the conference, and a key motivator in Santoyo and Kerr’s research, is connecting such research to tangible medical benefits. Meditators have long espoused such benefits, but support from neuroscience and psychiatry has been considerably more recent. In a February 2013 paper in Frontiers in Human Neuroscience, Kerr and colleagues proposed that much like the meditators could control activity in the PCC, mindfulness practitioners may gain enhanced control over sensory cortical alpha rhythms. Those brain waves help regulate how the brain processes and filters sensations, including pain, and memories such as depressive cognitions. Santoyo, whose family emigrated from Colombia when he was a child, became inspired to investigate the potential of mindfulness to aid mental health beginning in high school. Growing up in Cambridge and Somerville, Mass., he observed the psychiatric difficulties of the area’s homeless population. He also encountered them while working in food service at Cambridge hospital. It’s a long path, perhaps, but Santoyo and his collaborators are walking it with progress. As evidence of its effectiveness grows, more doctors are prescribing meditation to help boost the body’s healing powers. The stress of caring for her ailing parents, then grieving their deaths eventually caught up with Sharyn Resvick. She suffered from shooting pain in her shoulder from a pinched nerve. Worse, she could feel her heart pounding and battled feelings of panic. “My body just crashed,” said Resvick, 55, of Plymouth. Instead of going on medication, she took a different tack: meditation. Her remedy of choice was endorsed by her doctor, who scanned her heart to rule out other issues, then suggested she use mindfulness-based stress reduction (MBSR) — a popular meditation program — to manage her symptoms. As with yoga a decade ago, meditation is slowly expanding beyond its fringe following, appealing to a wider audience, even in the data-driven medical world. More doctors are prescribing meditation to help treat anxiety and depression, lower blood pressure and manage pain, according to a recent study by the Harvard Medical School. It’s one of several studies showing that meditation can actually alter how the brain works. The trend has gained a foothold especially among health professionals, some of whom practice meditation themselves to cope with the demands of their stressful occupations. Ever so gradually, they’ve moved from practicing the technique to preaching it. For a long time, doctors who meditated were quiet about it, said Dr. Selma Sroka, medical director of Hennepin County Medical Center’s Alternative Medicine Clinic. Sroka is a big believer in meditation’s healing powers. The body’s stress response, also known as “fight or flight,” is aggravated by emotional or physical stress, she explained. The opposite of that reaction is the body’s relaxation response. Meditation triggers that response. She often recommends that her patients give their minds a rest for a few minutes each day to help their bodies heal. Getting a patient who has suffered a heart attack, for example, to see the importance of the mind-body connection to their recovery is the first step. “Then, right there in the exam room, I will teach them a simple deep-breathing technique and have them do it for three to four minutes,” Sroka said. She instructs her patients to aim for meditating for 10 minutes a day. “I’m trying to plant seeds,” she said. Like Sroka, Dr. Debra Bell, a family medicine doctor, regularly prescribes meditation to her patients. She works for Abbott Northwestern Hospital’s Penny George Institute for Health and Healing in Minneapolis and recommends several meditation resources to her patients. She suggests classes and books to help them learn different techniques and gives some basic instructions herself. Advances in methodology are allowing researchers to integrate mindfulness experiences with brain imaging and neural signal data to form testable hypotheses about the science – and the reported mental health benefits – of the practice. Hay fever and other allergies could be made worse by stress, and some scientists believe meditation and breathing exercises may be the key to relieving flare ups, according to a report by the Daily Mail. Researchers looked at 179 patients over 12 weeks and monitored their allergies, and the study was published in the journal “Annals of Allergy, Asthma & Immunology,” revealing the 39 percent who had more than one allergy flare-up had higher stress levels than the rest of the group. Also, a number of those tested said they had allergy flare-ups that coincided with how stressed they were feeling. Researchers suggested meditation, deep breathing, and avoiding smoking and coffee could help keep stress levels down, and a healthy diet and regular exercise may also reduce symptoms. The NIH community was delighted to welcome His Holiness the Dalai Lama on March 7 to present the annual NIH J. Edward Rall Cultural Lecture, in which he discussed “The Role of Science in Human Flourishing.” Not surprisingly, the event—a conversation between the Dalai Lama and NIH Director Dr. Francis Collins—drew a large and engaged audience. 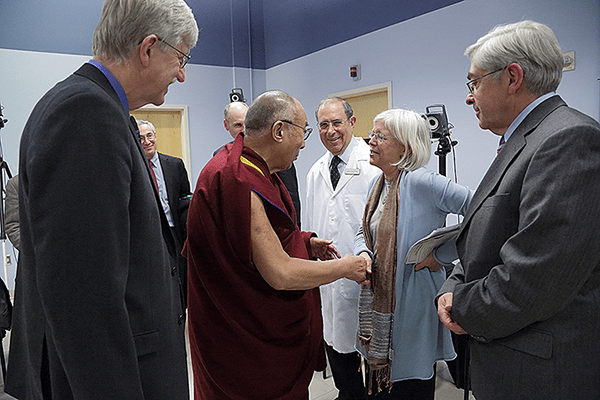 While the Dalai Lama was here, I was privileged to be among a small group to accompany him for a visit with a child enrolled in an NIH Clinical Center study on rehabilitation for childhood cerebral palsy. Researchers at NIH are interested in learning how physical exercise and training in rehabilitation affect the neuroplasticity of the childhood brain. The Dalai Lama’s warmth, infectious laugh, and curiosity about the research completely won over both patients and staff. NCCAM grantee Richard Davidson, Ph.D. from the University of Wisconsin-Madison accompanied him during the visit and has worked with the Dalai Lama and other Tibetan monks to examine how the mental exercise of meditation might impact the brain in order to improve health and well-being. Here at NCCAM, we have held a long interest in the research of meditation for health purposes and have supported a number of studies. Past studies have established an association with changes in the electrical function of the brain; more recent studies indicate possible neuroanatomic changes associated with the practice of meditation. It was fascinating to hear the Dalai Lama’s insights on the connection between science and the human condition—for example, the biological impacts of a mother’s loving touch on her newborn’s development. I am intrigued and look forward to continuing our research on how the brain is changed by varying emotional states and how that affects our physiology. A new project by the Medical Mediation Foundation, aimed at breaking down tension between family members and health professionals when there is a disagreement about a child’s course of treatment, is in full swing at Evelina London Children’s Hospital, The Guardian reported. Noting the importance of communication between caregivers to a child’s recovery, the Evalina Resolution Project offers mediation at the request of parents or staff members, and trains hospital personnel in stress management techniques. It also teaches staff how to recognize triggers for conflict and ways to rebuild trust when a situation deteriorates, the article states. More than 90 staff nurses have completed training sessions, with doctors set to begin training this month. The sessions help staff think about issues from the parents’ perspective and reflect on how their actions impact them, according to the article. The program is especially helpful for staff who interact with parents of children in the hospital for long-term care, because they become experts in their children’s condition and “their threshold is lowered for what they’re prepared to tolerate from health professionals,” Medical Mediation Foundation Director Sarah Barclay, who set up the project, told The Guardian. Mediation isn’t the only approach hospitals take to help personnel manage difficult situations and stress. Cleveland Clinic in Ohio offers “Code Lavender,” a holistic care rapid response to clinicians in need. Within 30 minutes of hearing the code, a team of holistic nurses arrive to give Reiki, massages, healthy snacks, water and a lavender armband to remind the doctor or nurse to take it easy the rest of the day, FierceHealthcare previously reported. In addition, an Aetna study found insurers can save money if their members participate in a mind-body stress reduction program, according to FierceHealthcare. Can Meditation Affect Your Genes? There’s a large and growing body of evidence that psychological stress — the kind experienced by war orphans, caretakers of people with dementia, and men and women with post-traumatic stress disorder (PTSD) — can cause genetic damage. But if psychological stress can cause genetic damage, can stress-relieving activities such as meditation and mindfulness training help reduce genetic damage? Perhaps: A recent study seems to suggest that a period of meditation might alter the expression of genes that are linked to inflammation and promote a faster recovery from a stressful situation. Researchers at the University of Wisconsin-Madison took blood samples from 40 volunteers — 19 of whom were long-term meditators — before and after an eight-hour session. The group of experienced meditators spent the session in guided and unguided meditation; the other group watched documentaries, read and played computer games. There was no significant difference in genetic markers between the two groups at the start of the eight-hour test period. However, at the end of the day, researchers found reduced expression of certain histone deacetylase (HDAC) genes and of the genes RIPK2 and COX2 — all of which are linked to inflammation. These findings are important because of the role inflammation plays in the progress and treatment of disease. Recent research has found that chronic inflammation may be at the core of diseases such asrheumatoid arthritis, asthma, heart disease, lupus, cancer, ulcerative colitis and Crohn’s disease . “The changes were observed in genes that are the current targets of anti-inflammatory and analgesic [pain-relief] drugs,” Perla Kaliman, lead author of the article (published in the journal Psychoneuroendocrinology) and a researcher at the Institute of Biomedical Research of Barcelona, Spain, said in a statement. In a stress test, the volunteers were forced into an impromptu public-speaking role involving mental arithmetic performed in front of two judges and a video camera. Levels of cortisol — a hormone associated with high stress levels — were measured before and after the stress test. Among both groups of volunteers, those participants with the lowest levels of RIPK2 and HDAC-2 genes had the quickest return to normal, pre-stress test levels of cortisol. “To the best of our knowledge, this is the first paper that shows rapid alterations in gene expression within subjects associated with mindfulness meditation practice,” study co-author Richard J. Davidson, professor of psychology and psychiatry at the University of Wisconsin-Madison, said in the statement. This recent study supports other research that seems to indicate there’s real, measurable benefit to lifestyle modifications like stress reduction. A 2013 study from the University of California, San Francisco (UCSF), found that men who ate a better diet, exercised moderately and led a less-stressful lifestyle for a few years had an increase in the length of their telomeres — the caps at the ends of chromosomes that protect them from deterioration. And a study from Carnegie Mellon University in Pittsburgh found that adults with shorter telomeres were at an increased risk of catching thecommon cold compared with people with longer telomeres. Though some may find the proposed link between meditation and genetics a bit far-fetched, a growing number of experts believe the association is real. “It is well established that chronic stress and acute stress are associated with both greater inflammatory proteins as well as gene expression of inflammatory pathways,” said Elissa Epel, professor of psychiatry at UCSF. The University of Wisconsin-Madison study was funded by grants from the National Center for Complementary and Alternative Medicine of the National Institutes of Health (NIH), the Fetzer Institute, the John Templeton Foundation and an anonymous donor. Follow Marc Lallanilla on Twitter and Google+. Follow us @livescience,Facebook & Google+. Original article on LiveScience.